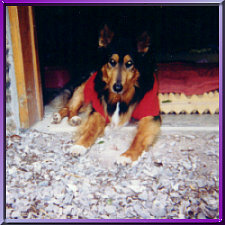 When my beautiful dog Shadow was sixteen years old it became apparent that she was drawing near the end of her life. Sharon and I began to work with her telepathically. When I learned that Shadow's favorite color was electric blue and that the vibration of the color was very important for her I felt so relieved knowing that there was something I could do for her that would bring her pleasure. I found yards and yards of fabric in electric blue. I placed some of the fabric on her bed and favorite sleeping places. In the room Shadow and I spent the most time I also draped some of the fabric over a table. Everything I owned in electric blue ended up in that room. I had been worried about Shadow's desire to spend more and more time in the garage away from the family. I didn't think the isolation would be good for her. When I learned that Shadow loved spending time in the garage because she loved nature and felt a need to say goodbye to the outdoor world she loved so dearly and that she felt better in the coolness of the garage, I began to let her stay in the garage with the door open so that she could see out into the yard she loved so much. I took more of the electric blue fabric and draped it from the garage door and from shelves forming walls of beautiful electric blue. More fabric went on the floor and just outside the garage door. 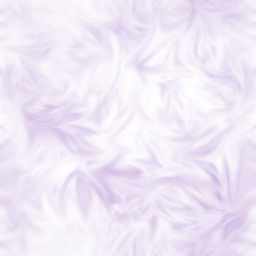 She rested on this beautiful color which seemed to give her a sense of quiet energy and peace. I do not know if she could see the color because she was almost blind, but I do know that she felt the radiance of the color and the love that went into providing it for her. It helped me because I was doing something to make her last days special. The garage became her temple! In the evenings during Shadow's last weeks, I created ceremony and little rituals in honor of her transition process. I just followed what my own heart told me. I took what was sacred in my own belief system and created the ceremonies. For instance I took holy Water and anointed her head - like baptism into a new life. I would sing her songs of peace. Her favorite was Ya Salam a Sufi song of peace. This would occur after a sponge bath I would give her. The most amazing thing to me was how attentive she was during this special time together. Afterwards she always slept so peacefully. The ceremonies made her death process so very sacred for the both of us. I felt I was doing something to help. Instead of this time in our relationship being sad it was a time of celebration and joy. 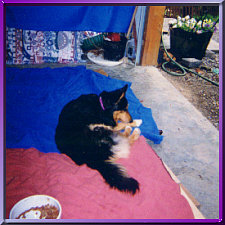 When her little spirit left, my husband Jerry and I wrapped her body in her beloved blue cloth and placed her wrapped body in the wagon she had loved being pulled around in when she could no longer follow us around the garden. We positioned the wagon just inside the door to the garage with the door open in the spot she loved so much. This created a viewing for Nature to view her body one last time. Our other dogs Katie and Nikei were like two curious children coming to see her whenever they wished before we put her body in the ground. They had time to say their goodbyes. I place what was sacred to me around her body. Holy pictures and candles. Before burial we anointed her body and her resting place with Holy Water. We placed some things that were sacred to her and to me in the ground with her body. Giving her the gift of leaving gently in her own way and time and sharing this experience with her has been her greatest gift to us. Shadow's resting place is just below our house before the woods. We created a beautiful flower garden from natural wood with a beautiful red rose bush representing the beauty and love that she brought to our lives, and two bleeding heart bushes in the center to represent me and my husband who love her so. Sometimes you get very tired when caring for your beloved dying animal and even wish at times that it could be all over. It is very important not to feel guilty over such thoughts. This is part of the process. You get through it remembering the special moments like the ceremonies, the garage temple and above all, the sixteen years of joy we shared together was what sustained me. 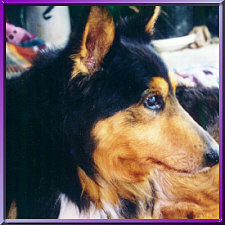 ***The Photo of Shadow at the top of the page was taken just a week before she died. The center shows Shadow in her beautiful garage "temple" with the blue cloth that she requested. In the bottom photo she sits in the garage doorway looking out at the garden that she loved so much. Shadow was radiantly beautiful and present right to the end of her life.